It’s always fun to see your previous boat so we had to get a picture of the C&C 37+ with the Mixer. When Dan came home from the Army he was flipping through an apartment hunting magazine at the same time his dad was flipping through the local sailing magazine. Dennis found a boat for sale that was similar to a boat that Dan admired as a child, a Swedish built Maxi Mixer, owned by a friend. They did some investigating and it turns out it was the same boat their friend had once owned, it had a new owner and new name but it was the same boat! Rather than get an apartment he decided to buy the Mixer and live aboard. In 2005 Dan & Ashley purchased a brand new 40’ C&C 121. She was a beautiful boat and a dream to sail. We spent many, many days racing with friends. Our first long trip aboard, however, revealed some deficiencies in storage and comfort levels. In 2008 we sold her with the intention of taking quite a few years off from boat ownership. With the money we’d be saving on moorage and boat payments we could just charter wherever in the world we desired for a few weeks each year. We decided the boat for us was another C&C but this time an older one with more amenities, a 40’ C&C 37+. We had 1 particular boat in mind that was somewhat local so we made the trip to Vancouver BC. One look at the boat on the dock and we almost didn’t even get on board. First of all it had an in-mast roller main, dinghy davits and solar panels. Her hull and decks were ugly beige (technically adobe) and it had even uglier colored canvas dodger and bimini, and a glass windshield! Who turns a fast C&C into a cruising boat?!?! Since we’d driven all that way we thought we might as well see how awful the interior was and after 30 seconds on board decided it was the boat for us. Turns out all the things that made us almost turn away were things that made her a wonderful boat to spend time on. Also, she hadn’t lost much of her C&C speed with the additional weight and windage. We had our first child in December 2010 and did a pretty good job of using the boat as much as we could. In early 2012 we found out we were expecting again, we were about to have 2 under the age of 2! Two weeks before our son was born we took the boat out of the water and put her up for sale. Clearly there’d be no way we could be on the water for the next few years. We wanted to get back on the water eventually so started looking at what boat might serve our long term need. After owning 3 boats we knew what we wanted. Our next boat needed to have 3 cabins that each slept 2, a large galley, center cockpit, tall mast and fin keel but with a skeg hung rudder, and sporty lines vs traditional. Thank goodness for Yachtworld.com as you can search for anything your heart desires. Obviously we needed to sell the C&C before we could get anything else anyway and we wouldn’t be ready to sail again for a few years after that so we had plenty of time. In the spring of 2014 the C&C finally sold and we were without a boat. 2 months later Dan got the boat itch and we purchased a 24’ Cobalt ski boat. We were able to get to some of our favorite destinations, quickly, though they were just day trips. Back in 2012 when we started researching our next sailboat we discovered that a Tayana 55 might serve our needs well and was within our budget. Google is an amazing device so we googled “Tayana 55” and came across the blog of a family that had one and cruised from California, to Mexico, to Costa Rica, Hawaii and back. Dan read the entire blog. Over and over and over. At the time there were 2 for sale in the San Francisco bay area, and one was this family’s boat. 2013 America’s Cup was happening in San Francisco so we made the quick drive down to watch some fast boats and see what a Tayana 55 actually looked like. The first one we saw was pretty old, ugly, and in need of a lot of repair. Next we went to see the one from the blog. We walked down the dock, turned the corner and there she was. Ugh, she looked like a cruise ship with a mast. She had gigantic anchors on the bow and the freeboard was extremely high. We got onboard just in case (we had previously done this and ended up falling in love). On deck it seemed just as big. The interior was really nice but it was just TOO MUCH boat for us. We left California disappointed but at least knew what we didn’t want. The search continued. Except that it really didn’t, we couldn’t find any other boats we liked that were within budget so we were kind of stuck. We often thought of that boat in Alameda but truly she was too large for us. Nearly a year later a sailboat broker friend of ours called to let us know of a Tayana 55 for sale in our area that wasn’t going to be listed publically. We decided to take a look and while we weren’t head over heels in love we noticed that all the things about that blog boat didn’t bother us this time. Truth be told we looked at Yachtworld all the time to look at the Alameda boat and probably more often at the family’s blog. At the same time a friend asked how the boat search was going, she asked Dan what we’d do and how we’d feel if the blog boat sold. He didn’t have a good response and called Ashley with the same question. Both had the same answer. We knew what we needed to do. One of our favorite quotes is from Maya Angelou “if your dreams don’t scare you, they aren’t big enough”. 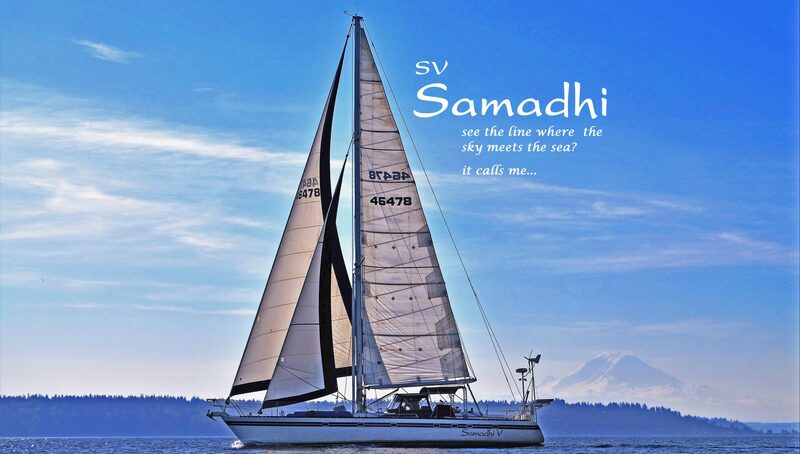 So we took the plunge and brought Samadhi V from California to Washington so the next family (us!) could enjoy adventures aboard.